If you thought it wasn't possible for the royal family to get any more adorable, you're about to find out how wrong you really are. Last week, Kate Middleton and Prince William took a vacation to the French Alps with Charlotte and George, and the resulting photos look like they belong on a postcard. I mean, we all already knew that this family was beautiful, but these pictures really drive the point home. 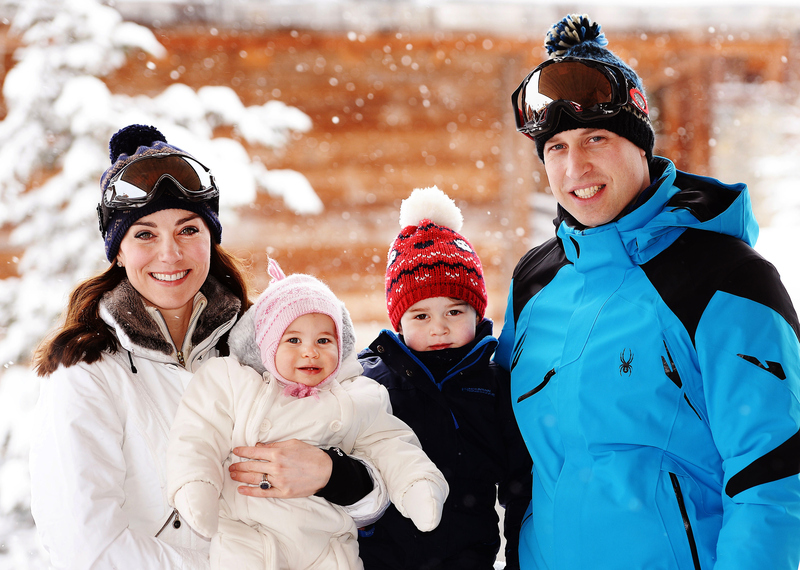 The kids are all rosy cheeks and smiles, surrounded by snow capped trees and flakes in the air, while Will and Kate basically look like kids again themselves, playing in the fresh white powder. And even without the photos, the details of their trip sound pretty magical. According to Kensington Palace's official Instagram account, Will and Kate brought along their press photographer to capture their ski trip, which is a good thing because it involved a lot of firsts for the family. It was their first trip with Charlotte and the first time she and George had ever played in snow, so it's extra sweet that the look on their faces during this magical moment is something they'll have forever. And since Will and Kate used to go skiing a lot before they had kids and while they were dating, it's really nice that they're now able to do that again, but with their children. And even though my parents took my sister and me on plenty of vacations growing up, none of them quite looked like this. In fact, I'm willing to bet there are a lot of ways the royal family's vacations are a lot better than the real thing. On a real family vacation, it can be really difficult to get everyone in the same place at the same time (and in the right mood) to take a photo... and it's like pulling teeth to get kids to pose and smile. I know this, because I am guilty of doing it myself. Sorry, Mom. Or, you know, asleep. And I'm sure both of those things apply to Charlotte, too, but this photo is adorable enough to let me believe that she's a perfect angel baby who can do no wrong. Look at that face! In my experience, snowball fights are actually wet, messy, and really, really unpleasant, and at least one person involved is crying after getting hit in the face with a block of ice. You don't want that as your photo op. Nothing can ever be this gorgeous again. It just can't. OK, Will and Kate. You win this one. And now, after seeing these photos, I seriously hope that George and Charlotte's first trip to Disney World is in the future... and that they bring their photographer along. Those are photos I need to see!